Spoken contemplative Holy Eucharist using Rite Two from the Book of Common Prayer. Spoken Holy Eucharist using Rite Two. This is a less formal service that is printed in the bulletin, featuring contemporary music and instruments. Child care is available during this service. Choral Eucharist using Rite Two from the Book of Common Prayer. Our most formal and "high church" service. Traditional music and anthem with full Chancel Choir and pipe organ. Join us for coffee and conversation in the Great Hall after all morning services. 6:30 PM - Episcopal Campus Fellowship meets at Viking Union on the campus of Western Washington University. Click Here to go to the EpiC website. 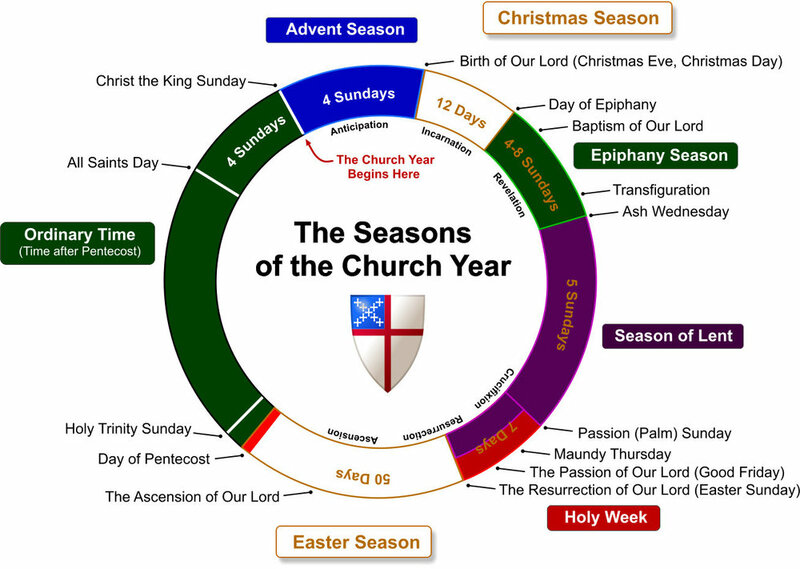 Click here for a link to the Lectionary (The Liturgical Calendar) from the National Church. This is the basic schedule of lessons for all American Episcopal Churches for the entire year. First time visitors and guests are welcome! Children and youth are also ALWAYS encouraged to attend services and serve as lectors and acolytes. 8:45 to 12:00 - Nursery birth to 3 yrs. 10:00 to 10:25 - All Children gather in the Sports Hall for free play & games. At roughly 11:20 the younger children are escorted to join their families in the main sanctuary for the Eucharist. If you are not attending services, pick up your children in the Sports Hall at 11:20. At the 10:30 service. our Youth Group may sit in the reserved pew in the front of church. We will leave worship after communion for our classes from 11:45-1:15 (lunch is provided). We know that babies cry, toddlers get restless, and siblings squabble in the pew. It’s part of life. However, if you would rather your young children be in the Nursery, it is located downstairs in the Education Wing, and all who work with children are trained and loving. We also have children's "busy bags", along with crayons, and a variety of books available at the rear of the sanctuary. "The Episcopal Church is powerful and unique because of the rituals that we participate in. The prayers that we are saying are spoken by over 80 million Anglicans around the world. It’s a time and space warp. You come as an individual, but you are actually part of a collective force of people, all speaking the same words and praying the same prayers in the same ritual. It’s comforting and thrilling. You know that others are experiencing the same thing at that moment, and everyone is joined in the simultaneous awe of Jesus' love and kindness. You always feel a deep connection when you realize that you are contributing an important part of the ritual." We sit down together to worship the God we all love. Taizé inspires us to reach across the barriers that separate Lutherans from Methodists,Protestants from Catholics, Christians from Muslims and believers from unbelievers. We are all children of God seeking truth. Once we remember this, that we are united in Christ, then we can work toward becoming the Church. Taizé services are held from 5:00 to 6:00 PM on the third or fourth Sunday of each month during the school year. The service is in the main sanctuary of the church. Childcare is usually provided. There is usually a Labyrinth Walk in the Great Hall before the service beginning at 4:00, and also after the service from 6:00 to 7:30 PM. Nov 25, 2018: "Wait for the Lord"
Note: These are the names of the "Theme Songs" in their original language. The English title is not an exact translation, but rather the title of the English text we will be singing. The songs establish the overall theme of each prayer service. THANK YOU to the talented musicians and singers that make our Taize season such a blessing each year, especially Wade Dingman, our Music Director, and Lee Cunningham, who selects the theme, music, Scripture, and prepares our programs each month. We are grateful to those who served as Cantors and those who faithfully set up the labyrinth each month. Please share the gift by inviting a friend, neighbor, or colleague. Child care is usually available during Taizé prayer service in the downstairs children's area. St. Paul's labyrinth is always set up in the sports hall before and after the Taizé services, and at other select times during the year. Guides are available. A slow meditative journey through the labyrinth is another way to calm the mind and deepen this experience. The Labyrinth with candles at Christmas. The Taizé Community is an ecumenical monastic order in Taizé, Saône-et-Loire, Burgundy, France. It is composed of more than one hundred brothers, from Catholic and Protestant traditions, who originate from about thirty countries across the world. It was founded in 1940 by Brother Roger Schütz, a Reformed Protestant. The community has become one of the world's most important sites of Christian pilgrimage, with a focus on youth. Over 100,000 young people from around the world make pilgrimages to Taizé each year for prayer, Bible study, sharing, and communal work. Through the community's ecumenical outlook, they are encouraged to live in the spirit of kindness, simplicity and reconciliation. The community, though Western European in origin, has sought to include people and traditions worldwide. They have sought to demonstrate this in the music and prayers where songs are sung in many languages, and have included chants and icons from the Eastern Orthodox tradition. The music emphasizes simple phrases, usually lines from Psalms or other pieces of Scripture, repeated and sometimes also sung in canon. Want to become part of the Taizé Choir? If you read music, (or if you don’t, but you follow well) you are invited to be part of the Taizé Choir. Simply show up at the right-front corner of the Nave at 4:15 PM before each Prayer when we practice the songs of the day. The purpose of the choir is to lead congregational singing and provide the parts in the Ostinato Chorales as a part of the congregation. The choir and cantors sing from the front pews, in the same style as The Church of Reconciliation, Taizé, France. In The Church of Reconciliation, Taizé, France, the choir is formed when the pilgrims arrive on Sunday Afternoon. During the Prayers (3 per day), the choir sits on the steps located on the front-right of the Nave and is hidden from much of the congregation by a pillar. The choir director sits on the floor in front of the choir along with the guitar player. The Cantors kneel among the brothers in the center of the nave. Ash Wednesday marks the first day, or the start of the season of Lent which begins 40 days prior to Easter (Sundays are not included in the count). Lent is a time when many Christians prepare for Easter by observing a period of fasting, repentance, moderation and spiritual discipline. The priest marks a sign of the cross on your forehead using ashes from the palm fronds that we used on palm Sunday, that have been blessed. It is a reminder of our mortality and a sign that we are entering the period before Easter. So it's a cold Wednesday in February and you see somebody walking around with a black smudge on their forehead. Now you know: it's a very special smudge, in fact, it's a cross. And they know it's there—and they know why it's there. It's a symbol of an important part of their lives. Our worship also includes a variety of special services during the year, tied to the church calendar (Holy Week, Ash Wednesday, Epiphany, and more). Our priests will be glad to discuss and answer questions about our worship. What's with all the different colors?